There was 41 Bedford Crescent, where the excavator couldn’t figure out why the hole was filling so quickly with water. He thought he had severed an unmarked water supply line. After consultation with the City staff, a geotechnical engineer and an older woman who had lived on the street since Manor Park’s development, we learned that the source of the water was in fact an underground stream, buried in the process of levelling the landscape prior to development. (We are reminded of the fact that one can’t simply hide undesirable elements of the landscape.) $50,000 worth of aggregate and machine work created a permeable pad that could bear the weight of a new home, while allowing the stream to continue to run below. Then there were the artifacts excavated at 279 Crichton Street. Before the east end of New Edinburgh was built up, a railway line ran along the east shore of the Rideau River. Upon excavation, we learned that the space between the tracks and Crichton Street, had been used as a dumping ground for refuse of all types. 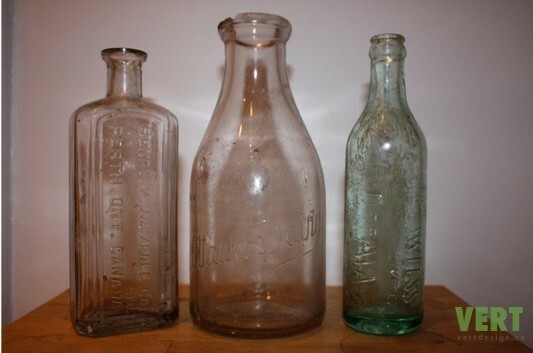 My favourite finds there were the hundred-year-old bottles (worth as much as $25 a piece). 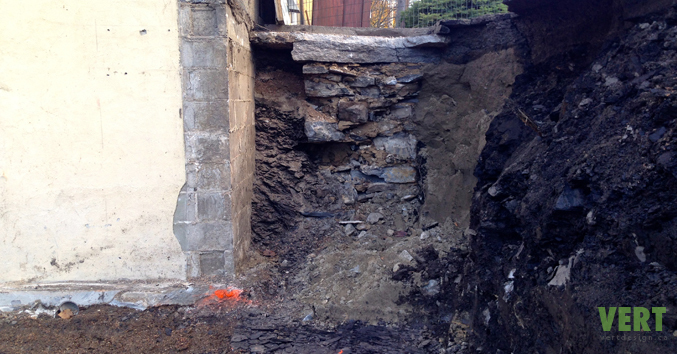 As I’m sure you have already gathered from the rather uninspired title of this post, an old rubble wall was exposed at 15 Dufferin Road during excavation. The wall, standing approximately 2 feet wide and 6 feet high, with cap stones approximately 8 inches thick, protected the eastern edge of the property before it was developed in 1945. It’s outline can be seen buried to the left of the cedar hedge in the image that leads this post. 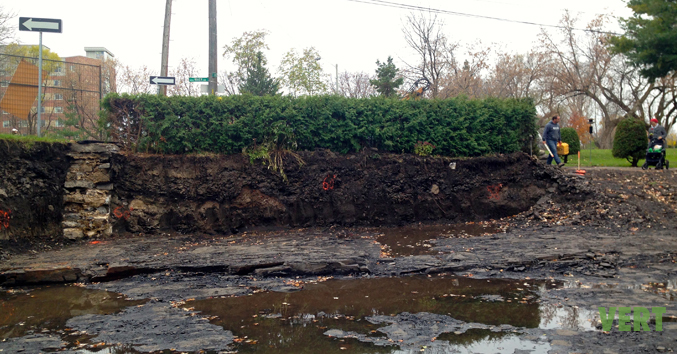 A close up of the wall can be seen in the image that ends this post; sandwiched between the foundation of the original home (constructed on the southwest corner of Crichton and Dufferin) and the Dufferin road bed. What the wall was offering protection from may never be uncovered, but my guess is that it was set in place to protect the oldest portion of the Neighbourhood (west of Dufferin Road) from Rideau River flooding. If you do know why the wall was constructed, please let me know.